Aaron Ramsey has lifted the lid on how he changed his season around after being booed by some of the Arsenal faithful at the beginning of last season. The Welsh international had a mixed start to his fifth full season at the north London club and was targeted by some Gooners who didn't believe he was good enough to wear the Gunner's red and white shirt. 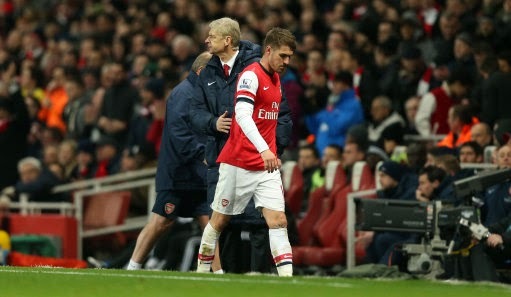 But since the start of the calendar year, the 22-year-old has been a virtual ever present in Arsene Wenger's side. That good form has rolled over into his sixth year at the club and seen him 13 out of 14 Premier League games for the Gunners, getting on the score sheet eight times and providing an assist in five other league matches. From being a target for the boo-boys, he's now a firm fan's favourite. "Last season, at the begining of the season, I wasn't happy with the way I was playing. "Obviously I had a few conversations with the boss and with my family and just went back to playing the way I knew I could and getting stuck in again and overcoming the mental side of what I was going through." "Obviously it was really difficult for me to go through but in those situations you really need to believe in yourself and your ability. "You show everybody what you're capable of in the end and it'll all click into place and then you'll just forget what happened and that's the past. "Hopefully now I've changed a lot of people's opinions and if something like that happens again with another player, hopefully they'll be a bit more patient with that player." Ramsey is expected to start in tomorrow afternoon's clash with Everton, a game which would put the Gunners seven points clear at the top of the Premier League if they win it.